Terrace Art Gallery is opened February - December with new exhibitions running each calendar month. Opening receptions take place the first Friday of the month from 7-9pm. www.terraceartgallery.com for more information. call 250.638.8884. visit 4610 Park Avenue, Terrace BC, V8G 1V6 - lower level of the library. F 12-6pm and SUN 1-4pm. 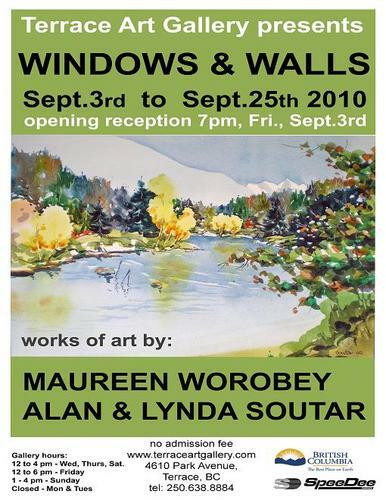 For the month of September, Terrace Art Gallery is pleased to present a lively exhibition of watercolour, ink, and stained-glass works by Maureen Worobey and Alan & Lynda Soutar. The exhibition runs from Sept.3rd to 25th, 2010.